When Queen Elizabeth II passes on the role of being our head of government to her son, Prince Charles, that would be an excellent time for Canada to depose the royal family of Britain from being the titular head of our country. Look, if we must have a royal family, we should make it representative of our country. So how do you have a titular head of government that truly represents a cultural mosaic? Any permanent choice for king or queen is going to cause controversy. Quite simply the new royal family might only rule for a year. Each year a fair lottery could be held throughout the land where every adult citizen who is not in jail would be entered. $10 or $20 for every citizen could be put in a pot from the government. That would amount to 300 to 600 million dollars per year. That money would be spent on the drawn winner and their family and maybe a close friend or three, say 20 lucky people. About 200 to 400 million dollars would be spent in automatic ways for upkeep and running of homes and vehicles. The rest of the money could be spent by our king or queen, however they see fit. It would be a sort of Brewster’s Millions thing. The winner can spend it but if they have anything to show for it, it gets taken over by the royal family trust. The money would have to be spent by the end of the year. If not the remainder will go to a registered charity or charities of the monarch’s choice. The monarch and the twenty family members or friends they choose to bring with them will leave at the end of the year but will be given a competitive salary for their time. This money would come out of the automatic upkeep money. The jobs of the monarch and up to twenty others will be held open for them for the next year. So they can live out the rest of their lives with no net loss to themselves. In case of an overspender that manages to spend all of the money, the royal family can do ribbon cuttings, etc. for the extra money it might bring in. We can do it Canada. We can make the monarchy fun. And every year, a new face would be struck on our coins. Any former monarch will have reminders of the time they had. Plus we can stick our tongues out at the Americans. Not only did we get rid of the British royal family without a war, we also have our own possible tourist attraction. And lastly, for all you monarchists out there, don’t worry about never seeing your precious British royal family again. The proof is in their continued visits south of the border. 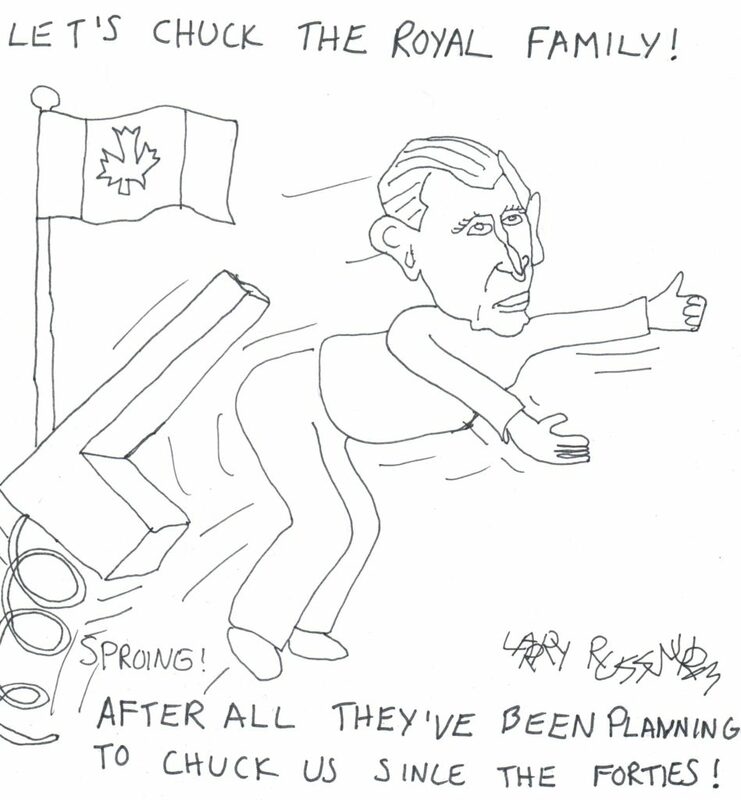 This entry was posted in Cartoon, Humour, Politics, Social Science and tagged Brewster's Millions situation, can get rid of the royals without a war, chuck the royal family, cultural mosaic, extra money for charities, jobs held open, lottery to determine the king or queen, Prince Charles, Queen Elizabeth II, ribbon cuttings for cash, the British royal family, the royal family, titular head of government, twenty members of royalty. Bookmark the permalink.